Has Mates become your best friend yet? This brand has been around for over 20 years and is the second largest condom manufacturer in the UK. Mates continues to evolve and develop to keep in step with market changes, personal preferences, customer demands and new product development keeping vigilant in regard to safety and reliability. If you have never used one of these condoms All Condom has a Mates trial pack that is popularly priced. You can try each one any maybe you will develop a new best mate. 1 x Mates SKYN Condom – SKYN® is the first premium condom made from polyisoprene – a scientifically formulated non-latex material that delivers the ultimate sensitivity that is the closest thing to wearing nothing. Polyisoprene material provides a softer, more natural feel than latex. 1 x Mates Natural Condom – Mates Natural Condoms have a unique flared shape making them easier to put on and more comfortable to use. 1 x Mates Ribbed Condom – Mates Ribbed condoms are a regular sized condom with textured grooves on the outside for increased stimulation. 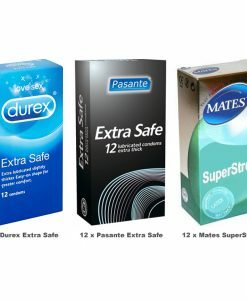 1 x Mates Super Strong Condom – These are designed to give you extra safety while still maintaining the high degree of sensitivity all men desire. Each condom is clear, smooth and features a reservoir end. While lubricated with non-spermicide lubricant, SK 70, users may enhance the lubrication if needed. 1 x Mates Intensity Condom – Mates Intensity condoms have rows and rows of raised Ribs and Studs, guaranteed to give both you and your partner maximum stimulation. This combined with a unique shape that is designed to provide additional sensitivity will ensure the ultimate intense experience for you both. 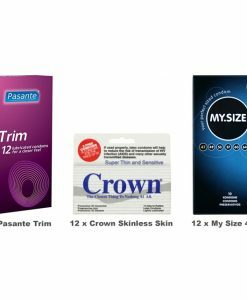 1 x Mates Ultra-Thin Condom – For the experienced user looking for the utmost in sensitivity while maintaining the maximum level of protection, look no further than Mates Ultra-Thin Condoms. This product offering is easy-fit and is 100% electronically tested. The Ultra-Thins are made from natural rubber latex.